Nor could they have dreamed that their success would take them to El Salvador to share their craft with a pet treat startup and make a lifelong friend. Bob, the allergy-prone pit bull and the “Bubba” in Bubba Rose, and Rose, the couple’s greyhound, were both rescues. Bob had a lot of food issues when the Talleys found him, so they refined his diet by swapping out the unpronounceable ingredients of processed store-bought pet foods, for high-quality organic ones. Eric and Jessica enjoyed creating healthy recipes and crafting doggie treats elaborately decorated with squirrels and paw prints. 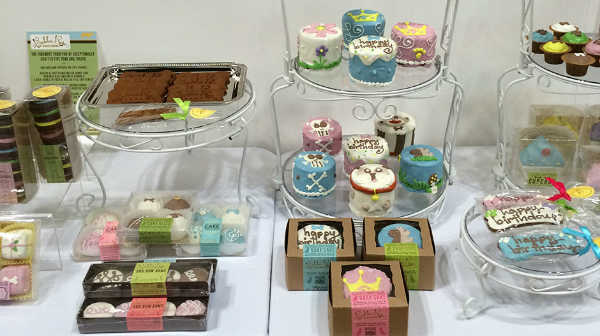 They loved it so much, in fact, that they turned their signature bone- and ball-shaped cakes, cupcakes and biscuits into a business. By 2014, Bubba Rose products were being sold in 1,100 locations across the U.S., Europe and Asia. The Talleys also authored five dog cookbooks and garnered lots of press. Then Bpeace got wind of them, and another type of opportunity came their way. Would Bubba Rose Biscuit Company host an animal-loving entrepreneur looking to expand her veterinary business with a line of doggie treats? They decided they would. 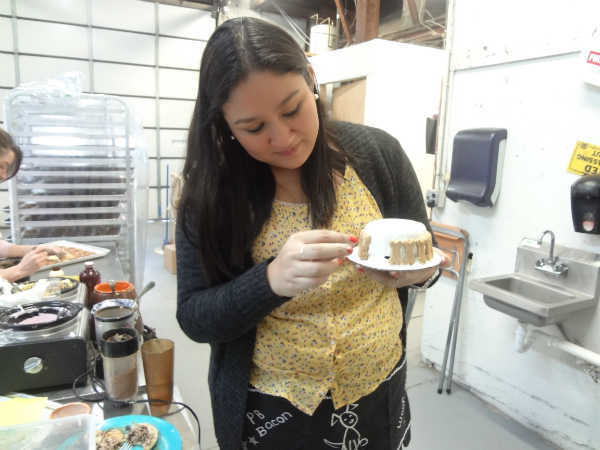 So when Bpeace brought Fast Runner Diana Figueroa to New York to learn best practices, she spent a week at the Talleys’ bakery in Boonton, New Jersey. But that was just the beginning. Remembering every nuance of what you’re learning can be challenging for an on-the-go entrepreneur, especially one away from her home base. To help Diana troubleshoot problems she had run into while implementing what she had learned in the U.S., Jessica and Eric signed on to be a Bpeace Traveling Mentor and spent eight days in El Salvador. Jessica and Diana both have backgrounds in branding and brand placement, and their common business language smoothed the way for collaboration. Each understood the importance of delivering a quality product to customers and, equally important, presenting it in a way that makes people want to purchase it. Q: What kinds of issues did you and Diana tackle? 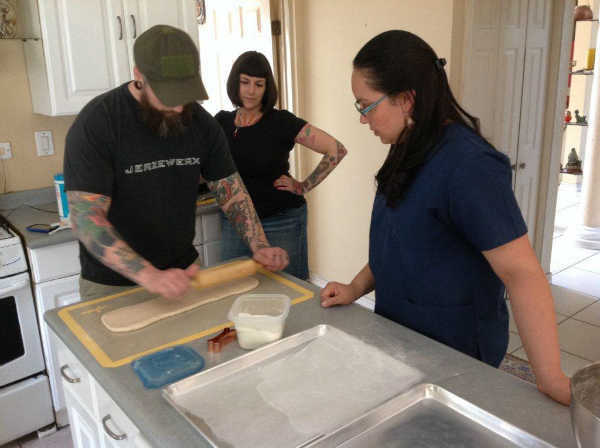 A: We did hands-on training in decorating and baking, and we went over recipe development, leaving her with a few recipes that she and her sister, Carla, used to start Woofkies Pet Bakery, and helping them create a few new ones. We also went over business strategy and wholesale development strategy—outreach to the marketplace, as well as marketing and branding of the product. Q: Was Diana open to your suggestions? A: Yes, very much so. She knew she wanted to pursue making dog treats but didn’t know how to go about it. She had just started making cakes for some customers, and she really liked it. She and her sister already had a veterinary shop with grooming and pet retail services. So she saw the viability of expanding into dog treats to grow their business further. We helped them get all of that rolling. Q: What other kinds of specifics did you get into? A: We started with recipe formulations and cost analysis. We were able to get their costs down by more than 50% on all their products just by going over their ingredients and finding better sourcing for them—for example, buying in larger quantities. Launching Woofkies allowed them to get into the marketplace as a wholesale product, which is what they wanted to do for wider distribution, but their pricing was cost-prohibitive. We got that squared away. Then we resolved some issues that arise in a bakery that are very difficult for people to figure out on their own, like shelf life and other common problems. We also went into a full marketing and business strategy for the bakery: how to launch and build products, who their target audience should be, and potential growth areas. For pet products, you have to think outside the box, which is part of what has made us successful. Q: What is an example of that? A: Diana already had a distribution channel set up through Peludos (the veterinary business), because they distribute animal toys throughout the region. It made sense for her to go after that same customer base with Woofkies. Also, we saw some luxury townhouse and condo complexes when we were driving around, and asked her if they took dogs. She said yes, so I suggested she go after that market, along with some of the more refined retailers throughout the city. Any of the various sweet shops are great places to reach out to with pet treats. If someone is buying a delicacy for themselves, it’s a perfect side purchase for them to get one for their dog. A lot of businesses that make sweets for humans don’t necessarily want to figure out how to make a dog product. But they are happy to carry one. And the customer is thinking, ‘That’s fantastic. My dog is sitting outside waiting for me right now.’ We helped Diana open up the true reach of where their product could be selling. Q: Will you and Diana continue talking or collaborating? A: We have been since Eric and I left El Salvador. She emails and texts me photos of what she’s working on, and I review them. She’s been redesigning her marketing materials, and we’ve discussed how to get everything rolled out. She’s also been sending me samples of new cakes she’s been working on for customers. Q: Sounds like you two have become friends as well as business associates? A: We’re totally friends now. When she was here for the week, we bonded pretty quickly. And I was looking forward to being able to go and help her, and truly understand her business market climate, because it is very different. We plan to go back next year to see them again and see how far they’ve gotten. We had dinner with her whole family, and I thoroughly enjoyed them. I expect we’ll have a relationship going forward indefinitely. Q: This experience sounds like more than just business coaching—it’s creating international goodwill. 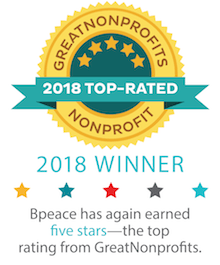 A: Yes, Bpeace is an amazing organization, and it’s definitely about a lot more than just business coaching. The experience of traveling there really solidifies that. I would highly recommend that any business mentor, if possible, travel to see their Fast Runner and work with them in their country. The experience and the level of reward have been eye-opening on a million levels. Q: You became a Bpeace member after working with Peludos? A: Yes. The process immediately intrigued us. As an entrepreneur, I’ve had a handful of mentors who have been invaluable to me. Sometimes it’s as simple as them telling you, ‘You’re following the right path, keep going.’ It’s very difficult to be an entrepreneur. You are going against the grain with everything you do, especially when you are in a niche business like mine. You don’t have a lot of examples of proven track records. So mentors and other business entrepreneurs meant the world to me, and they still do. There’s a handful of them that I can turn to for whatever I need. Diana was looking to pursue this same path with their business, and knowing the added struggles and hurdles that she had to overcome in El Salvador, which is definitely much more complex than it is in the U.S., I immediately felt compelled to help make her business grow. Q: Was getting to see El Salvador and experience another culture an added benefit? A: To be very honest, most Americans are not traveling to El Salvador unless they have family there. The likelihood of me seeing the country again, if it wasn’t linked with Diana, would be very slim. Yet El Salvador is this gorgeous little untouched gem. I am amazed at how diverse its landscape is. Diana and everyone we met were very proud of their country and all it has to offer. We were welcomed with such a warm embrace. It was nice to actually see some of the beautiful parts of the country, because the little bit of news that makes it to the U.S. from El Salvador is not positive. In most cases, it’s linked to gangs and gang violence. On the weekend, we went to Ataco, an old Spanish mission town on top of a mountain, with amazing architecture and murals. My husband loves to photograph and kept commenting on how the light played so beautifully and changed throughout the day. Diana and her sister said this made them look at their country differently and realize things they have overlooked. When we returned home, we also reassessed things in our country that we overlook. Some things that are so difficult for them are so simple here by comparison, like being able to go back to a store if you forgot something. It made each of us look at our own experiences with new eyes. Q: This is very inspiring. Not only are you teaching business owners about cost control and brand placement, but also how to expand their thinking. A: If I can do nothing but inspire someone, I’d like to do exactly that. I asked Carla and Diana, ‘What is your big goal? As high as your arms can reach? As high as the sky?’ Both of them froze. Peludos was Carla’s dream as a veterinarian. I had to remind them that when she started, it was in her garage. I asked her, ‘Did you think when you started that in seven years you would have moved to another space, outgrown that space, moved again, have a staff of nine, and your sister working for the business as well?’ You could see her eyes tearing up. We finally got the answer when they dropped us off at the airport. Their dream goal was to have both additional pet clinics and Woofkie’s bakeries in key retail locations throughout all of Central America. Making them see the big picture for themselves was really rewarding for me and for them. It’s giving them bigger goals to strive for. If you don’t dream big, you’re not going to go for it. So dream big!